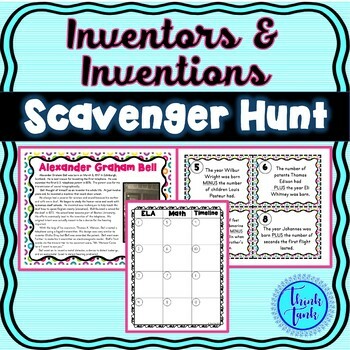 The Inventors and Inventions Scavenger Hunt can be used as an introduction or review activity. You can use the Inventors and Inventions resource as task cards, a scavenger hunt or both. The Scavenger Hunt is designed so that students must visit each of the ten fact cards at least two times! That means they have to read the small passage or skim for details twice! Students will use non-fiction social studies content to practice reading skills, improve fluency and reading comprehension. Also included are 10 ideas for how to use task cards! The possibilities are endless for this cross-curriculum activity! This engaging Inventors and Inventions activity covers the following inventors: Alexander Graham Bell, George Washington Carver, Thomas Edison, Louis Pasteur, Henry Ford, Benjamin Franklin, Robert Fulton, Johannes Gutenberg, Eli Whitney and the Wright Brothers. This Inventors and Inventions activity can be used as task cards for sub plans, partner activities, SCOOT activities, scavenger hunts, anticipatory sets, unit review, stations, or independent work. How you chose to set it up in your classroom is up to you J There are so many possibilities that allow students to be out of their seats, moving around the room and learning! 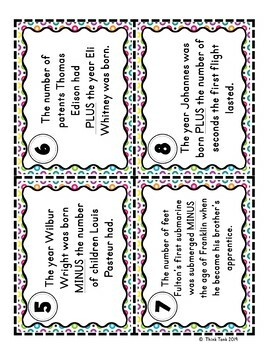 •10 Inventors and Inventions Fact Cards to hang around the room. 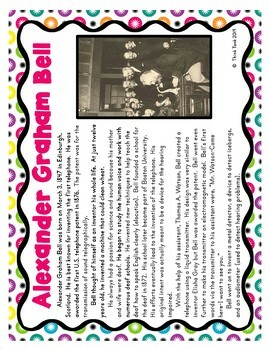 Each Fact Card contains a small reading passage, title and a picture. 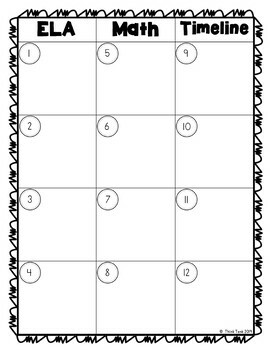 •One with the questions directly on it, the other is blank to use with the task cards. •The recording sheet is broken down into categories – ELA, Math, Timeline, Drawing and Writing. Copyright Information : © Think Tank Teacher LLC. Please note - all material included in this resource belongs to Think Tank Teacher LLC. By purchasing, you have a license to use the material but you do not own the material. You may not upload any portion of this resource to the internet in any format, including school/personal websites or network drives unless the site is password protected and can only be accessed by students, not other teachers or anyone else on the internet.